And things have not improved since. In case the American people do not have enough with which to concern themselves, The Blaze further draws our attention to Agenda 21, a Soros-sponsored plan for world government. Already two decades old, Agenda 21 is a United Nations plan for “sustainable development” that was backed by George H.W. Bush and 177 other world leaders. Despite its seemingly innocuous intentions, The Blaze notes that several items are at risk under the plan: private property ownership, single-family homes, private car ownership and individual travel choices, and privately-owned farms. In 1987, Vice President of the World Socialist Party Gro Harlem Brundtland wrote a report for the United Nations entitled "Our Common Future," which explained that environmentalism could be used as a tool to control all the people of the world and establish a one-world government. The Blaze contends that the growth of ICLEI [the International Council for Local Environmental Initiatives] and the creation of Agenda 21 is a step toward bringing Brundtland’s ideas to life. After all, the term “sustainable development” was first introduced by Brundtland. Agenda 21 proposes an array of actions which are intended to be implemented by every person on earth. … [I]t calls for specific changes in the activities of all people. … Effective execution of Agenda 21 will require a profound reorientation of all humans, unlike anything the world has ever experienced. While Agenda 21 was agreed to in 1992, Bill Clinton signed an Executive Order in 1995, establishing a Presidential Council on “Sustainable Development,” which essentially provided a permanent platform for the UN plan by circumventing the approval of both Congress and the American people. 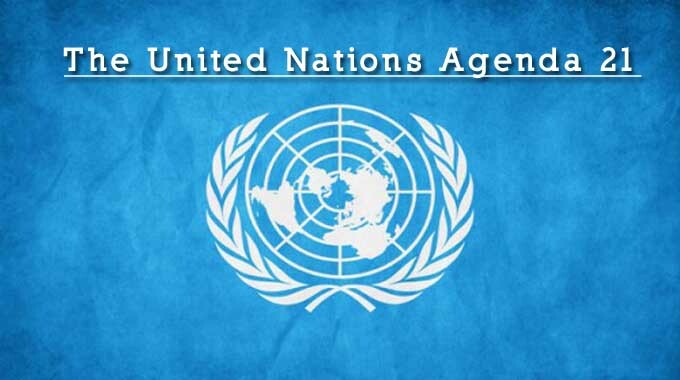 Participating in a UN advocated planning process would very likely bring out many of the conspiracy-fixated groups and individuals in our society. … This segment of our society who fear "one-world government" and a UN invasion of the United States through which our individual freedom would be stripped away would actively work to defeat any elected official who joined "the conspiracy" by undertaking LA21 [Local Agenda 21]. So we call our process something else, such as comprehensive planning, growth management or smart growth. More than 600 cities in the United States are members of ICLEI, though most residents of those cities are unaware that their local governments are agreeing to rules and regulations dictated by a UN-based organization regarding property rights. As observed by The Blaze, “sustainable development” is a more pleasant term for “social justice/socialism,” described by Agenda 21 as the right of the people “to benefit equally from the resources afforded us by society and the environment.” In layman’s terms, "social justice" is the justification for wealth redistribution. Land cannot be treated as an ordinary asset, controlled by individuals and subject to the pressures and inefficiencies of the market. Private land ownership is also a principal instrument of accumulation and concentration of wealth and therefore contributes to social injustice; if unchecked, it may become a major obstacle in the planning and implementation of development schemes. The provision of decent dwellings and healthy conditions for the people can only be achieved if land is used in the interest of society as a whole. The American Policy Center indicates that Agenda 21 has manifested itself in a variety of local projects, including Smart Growth, the Wildlands Project, Resilient Cities, Regional Visioning Projects, STAR Sustainable Communities, and most "green" initiatives including green building codes. Cities pay dues to ICLEI so that the organization may provide community plans, software, and training. The relationship between local cities and ICLEI is funded primarily by government and foundation grants. In California, Agenda 21 is already working on plans for sustainable management of open spaces. Debate over what open space entails has highlighted divisions between those who are directing the planning meetings and American citizens, including liberal Democrats, who are still interested in protecting private property rights. In Austin, Texas, the city council approved an “Energy Conservation Ordinance” in 2008. The ordinance adds a new chapter to the city code relating to energy conservation audit and disclosure requirements, and creates an offense and imposes penalties. Angered by the city council’s consideration of the ordinance, a group called Texans for Accountable Government began to scrutinize the council’s adoption of Agenda 21-friendly initiatives. TAG Member John Bush delivered a brief but concise presentation on Agenda 21 and ICLEI just prior to the vote that ultimately approved the ordinance.